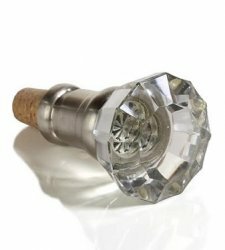 This glass wine bottle stopper has the ideal elegant design, and looks like a beautiful antique door knob! Made to fully seal your wine bottle this stopper is perfect if you are looking for something decorative and stylish. No need to stress about properly sealing your wine bottle any longer! Seal your bottle in style with this glass wine bottle stopper!